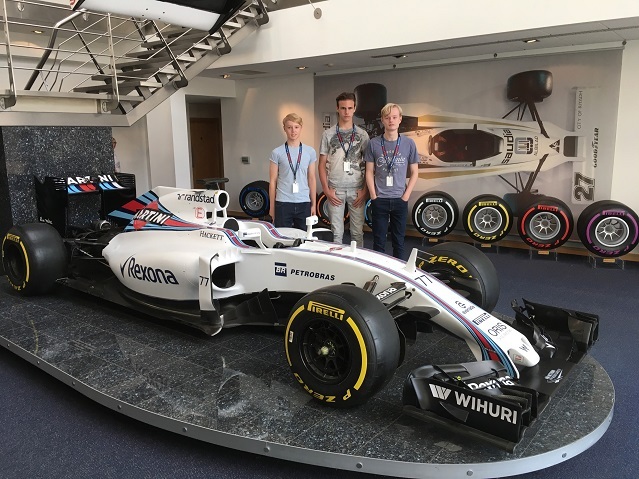 On 4th August 2018 the triple BSKC Champions from Brentwood School A attended a special VIP day at Williams F1 Heritage Collection with full hospitality as a prize for their success. The boys were treated to some once in a lifetime experiences which included sitting in an actual F1 car driven by Jenson Button! The highlight of the day was the tour of the multi-million pound Heritage Collection containing over 40 cars from Williams' illustrious past, each one with its own story to tell and driven by some of the F1 greats such as Senna, Prost, Hill and Mansell. The boys were thoroughly impressed with the insight they were given by the superb tour guide from Williams. Team Driver Ethan Brooks said, "I have been an F1 fan as long as I can remember and have followed it keenly all throughout my karting career and today only added to my passion for the sport and inspired me further. We would like to thank Williams F1 for the once in a lifetime opportunity that they gave us." Iaroslav Kovalev added, "I was really impressed by the technical innovation and insight that the personnel from Williams F1 were able to show us. I have been interested in car design for a long time so for me to be able to look at F1 cars this close was truly amazing." Team Captain Callum Brooks concluded, "Today was a fantastic insight into the history and workings of one of the greatest F1 teams. We were greatly impressed by the dedication and attention to detail shown by the team and this truly showed why F1 is the pinnacle of world motorsport." Before adding, "this truly shows the caliber of the BSKC with teams from the pinnacle of motorsport taking a significant interest in the competition." 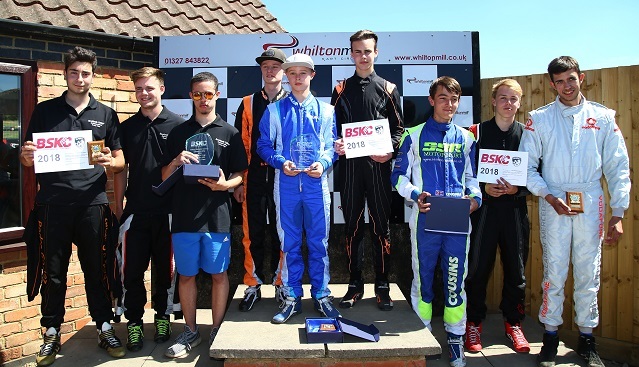 The team of three students from Brentwood School A were made to work hard to retain their title in a thrilling National Final at Whilton Mill in Northamptonshire on Saturday 30th June. However, consistent scoring and a victory in Heat 8 sealed a third successive title for the team with brothers Callum (17) and Ethan (14) Brooks and Iaroslav Kovalev (17) in the driving seat again this year. It was an emotional start to the event with Belfast Royal Academy winning Heat 1 and dedicating their victory to their former team captain, Elaine Alexander, who died suddenly earlier this year. Peter Symonds College, Southend High School for Boys and Woodmill High School put the pressure on with one win apiece and Sidcot School excelled with victory in Heats 6 and 9. But it was the drivers from Brooklands College that were catching the eye scoring stunning victories in their first three races. This included putting reigning champions, Brentwood A, in the shade with a dominant victory in Heat 3. True to form, Brentwood A fought back in Heat 4 and a close finish saw Brooklands College take the chequered flag by just 0.662 seconds. However, consistent scoring just gave Brentwood A the edge at the end of the competition. The students from Brentwood are looking forward to visiting the Williams Grand Prix Collection as their prize for winning the National Final. Their VIP visit will offer them a rare opportunity to tour the interactive museum which houses around 40 Williams Formula One cars dating from 1978 onwards. Students Pedro Gomez, Henry Jarret and Blaise Wheeler from Brooklands College finished as runners-up and the third step on the podium was taken by Peter Symonds College with drivers Dominic Cousins, Thomas Hastie and Sam Pooley. The prize generously donated by Ginetta Cars for the highest placed driver holding a competition licence was won by Ethan Brookes of the winning team, Brentwood A. He wins a free entry into the 2019 Ginetta Junior Scholarship which will see one budding racing driver win a fully funded season in the 2019 Ginetta Junior Championship. Taylor Norton of Barnet and Southgate College set the fastest lap in the National Final in the final heat with a time of 45.708 seconds and he will enjoy a day at a British GT event with Ben Green Racing who have been great supporters of BSKC since their driver, Ben Green, was part of the winning team from Debden Park High School in 2014. Adrienne Watson, Championship Administrator, was delighted with the success of the competition: "Our congratulations to the students from Brentwood School who are the first team in the history of the BSKC to win three National titles. All of the teams here at Whilton Mill should be applauded for the standard of their driving and their competitive spirit! We also thank the teachers and parents who give up their time to mentor their teams all the way through to the National Final. The BSKC is an arrive-and-drive karting championship that aims to bring competitive, cost-effective karting into UK schools. Since it began in 2007 with just 22 teams competing, the championship has flourished giving students who are not necessarily interested in traditional sports like football or hockey a chance to reveal hidden talents. Many schools have told us that taking part has built the confidence of the students and this has helped them both on the track and in the school environment." Twenty-six teams, representing schools from across the United Kingdom, will line up on the grid for the National Final of the British Schools Karting Championship 2018 at Whilton Mill in Northamptonshire on Saturday 30th June. National champions for the last two years, The Brentwood School A, have been impressive through the Local Finals and were victorious in the South and South East Regional Final with three wins and two second places. The team from The Southend High School for Boys pushed them hard at Buckmore Park and will be hoping to turn the tables in the Final. The team from Wymondham College in Norfolk were declared the Midlands and East Regional Champions. 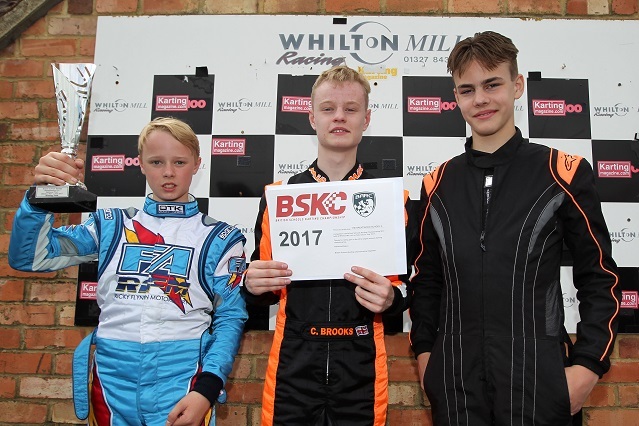 This was a tremendous achievement by them in their first year in the BSKC and we are looking forward to seeing them fighting for the honours at Whilton Mill. Gordon’s School A were the runners-up at Daytona Milton Keynes, pushing Farlingaye High School into third place on countback. Another team to catch the eye has been Peter Symonds College A from Winchester. They swept the board at the Local Final at Salisbury and followed this up with victory in the South and South West Regional Final at the Thruxton Kart Centre. They must surely be considered amongst the favourites to take the National title. It will be an emotional journey to Whilton Mill for the team from Belfast Royal Academy following the sudden death of the captain of their BSKC teams for many years, Elaine Alexander, earlier this year. They will no doubt be pushing hard to win the trophy in her memory. Joining them on the trip over from Northern Ireland will be two teams from Bangor Grammar School. Upholding Scottish honour will be last year’s runners-up Woodmill High School, together with George Heriot’s School and Williamwood School. Whilst The Grange School and Bolton School Boys’ Division will be flying the flag for the North of England. The races at the National Final are always close and competitive and excitement is building as we wait to see who will be crowned National Champions for 2018. Will anyone be able to topple reigning National champions, Brentwood A? The British Schools Karting Championship (BSKC) is pleased to announce a range of exciting prizes for the most successful teams and drivers at the 2018 National Final. Twenty six teams from across the United Kingdom will compete on Saturday 30th June for the coveted title "BSKC 2018 National Champions" at the Whilton Mill kart circuit which hosts the event for the sixth consecutive year. The three students from the winning team and one representing adult will be given the opportunity to enjoy a Heritage Tour of the Williams Grand Prix Collection. The group will tour the state-of-the-art, multi-million pound Grand Prix Collection. This interactive museum houses around 40 Williams Formula One cars dating from 1978 onwards. Seminal race cars that carried World Champions such as Alan Jones, Keke Rosberg, Nelson Piquet, Nigel Mansell, Alain Prost, Damon Hill and Jacques Villeneuve to victory over three decades of racing are on display, together with interactive displays tracing evolving technologies and historic racing incidents. We are most grateful to Williams for providing this terrific prize. The prize for the highest placed competition licence holder* whose date of birth falls between 1st January 2003 and 21st March 2005, and who has not previously competed in an MSA circuit car race, has been generously donated once again by Ginetta Cars. The fantastic prize of an entry into the prestigious 2019 Ginetta Junior Scholarship competition awaits the winner with the chance to win a free entry into the 2019 Ginetta Junior Championship. * Drivers must currently hold in 2018 or have held on either 2016 or 2017 a competition licence (any grade). We are delighted that Howard Green and his son, Ben, continue to actively support the BSKC. They will again sponsor the award for the driver setting the fastest lap at the National Final with a trophy and two tickets for one of the events where Ben will be competing later in the year. Ben's motorsport career has gone from strength to strength since being a member of the winning team from Debden Park High School in the 2014 BSKC National Final and he now competes in the British GT Championship. Every team competing at Whilton Mill can consider themselves winners having fought their way through the preliminary rounds to represent their school at the National Final. Ten competitive races on the day stand between them, the title 'BSKC 2018 National Champions', and the tremendous prizes on offer. It is sure to be a thrilling and action packed day for everyone. Who will be joining us on the grid for the 2018 BSKC National Final? This year’s Local Finals produced some excellent racing and a number of very close results as students battled to qualify for the Regional Finals. Two Local Finals deserve a special mention. The first is Salisbury where Wessex Raceway welcomed 10 teams this year after having their event cancelled last year due to low numbers. Peter Symonds College A swept the board there with a 100% win record. We were also delighted to welcome Mr Karting at Leamington Spa back as a venue (having missed the last two years) and they put on an excellent event which saw victory for Kingham Hill School. National champions for the last two years, The Brentwood School, are safely through to the Regional Final for London and the South East where they will face the champions from the previous two years – Debden Park High School – amongst others, including Caterham A who were our champions in 2012. All of the Regional Finals are expected to be very competitive but this line up at Buckmore Park on 21st April is surely worthy of a National Final! 14 teams will line up at Daytona Milton Keynes on 24th April for the Midlands and East Regional Final. Gordon’s School always set high standards but competition is sure to be fierce to qualify for the National Final. The Thruxton Kart Centre play host to the South and South West Regional Final on 29th April and always put on a great event. We are looking forward to seeing who takes the top step of the podium there in what is sure to be an exciting competition. All roads then lead to the National Final at Whilton Mill on 30th June where the successful teams from the Regional Finals will compete against teams that have qualified from the North of England, Scotland and Northern Ireland for the honour of being crowned BSKC National Champions 2018. With the holidays over, it's time to focus on motivating students to be the best they can be. 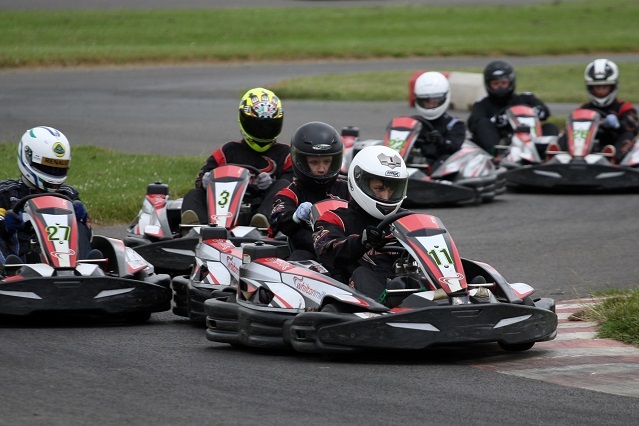 The annual British Schools Karting Championship offers a perfect vehicle for schools and colleges to motivate students and offer them a sporting competition that encourages team work as well as offering many other benefits away from the track. Karting is an exciting, safe and rewarding team sport that often appeals to students not interested by traditional school sports. The BSKC offers a cost effective entry point to this exhilarating sport and, with venues across the country, your nearest participating circuit should not be too far away. Registration for the 2018 championship is now open so it is time to get your school or college on board. The local stages of the competition will take place between January and March. Registration will be open until December 15th but teams are recommended to book early to make sure that their place is guaranteed. Register online at www.bskc.co.uk/register. Karts and safety equipment are provided so teams just need to turn up and drive. Although it helps, no prior experience of karting is necessary but we encourage teams to practice at their local track. Learning the racing line and details of the track will really pay dividends when the competition hots up! Build up interest in BSKC 2018 by downloading our new poster and sign-up sheet for your notice board from www.bskc.co.uk/students. There is a wealth of information for students, teachers and parents on our website. However please feel free to email us if you require any information that is not available on the website.